An expectant hush falls over the crowd. Eager anticipation is barely contained with fidgets and twistings for a better view. The air is full of sweet perfume and warmth. As the longed for arrival comes into view, a murmur begins to arise. What would they find? What would it look like? You’ll see, whispered those who had witnessed the miracle before. You’ll see! And then one nugget was plucked from the rest and held aloft for all to see. Carefully an end was removed from the fragrant brown oval. A spontaneous gasp from the gathering. It was true! The tomb was empty! The miracle lasted long enough for the teacher to swiftly distribute the remaining nuggets without fuss and disagreement. Then silence as the warm nuggets disappeared into anxious mouths. And discussion could begin – not always at a comfortable decibel. But always a lesson well-learned. 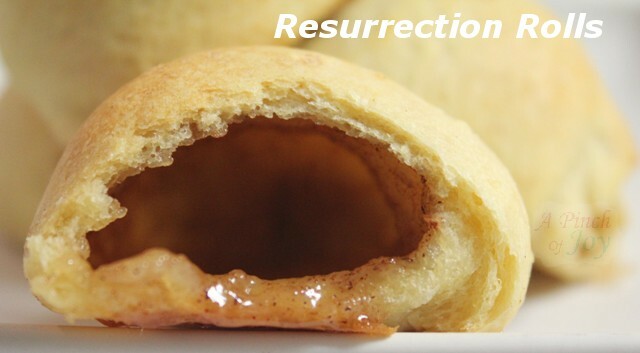 Also known as Easter Rolls or Empty Tombs, I first saw this recipe in a church school teacher’s guide. Some clever Christian Educator took a popular Pillsbury Bake Off recipe from ages ago and gave it new meaning. Some tips I’ve gathered for doing this with a group whether at home or church: Have fun! Guide the kids, but remember it is impossible to do this wrong. Pass around a bottle of hand sanitizer as you begin. Pinching the dough around the marshmallow is key. I usually have kids put the marshmallow on the narrow tip of the crescent and roll toward the larger end because it’s easier to pinch together and completely cover the marshmallow. Use Pillsbury Crescent Rolls because they seem to stay pinched better (leak less!) than other brands. Line the baking sheets with aluminum foil or parchment paper for quick cleanup – because, in spite of your best efforts, some marshmallow will leak out of at least one roll! You may have leftovers of butter and the cinnamon sugar mixture – but that allows for possible loss due to “mess”. Just before rolls are done, begin to build the anticipation as the rolls are removed from the oven and the first one opened. Have fun! These are also a great addition to any dinner, or as an accompaniment to a light soup or salad. The original recipe called for a confectioner sugar glaze and chopped nuts on the top to make a breakfast treat. 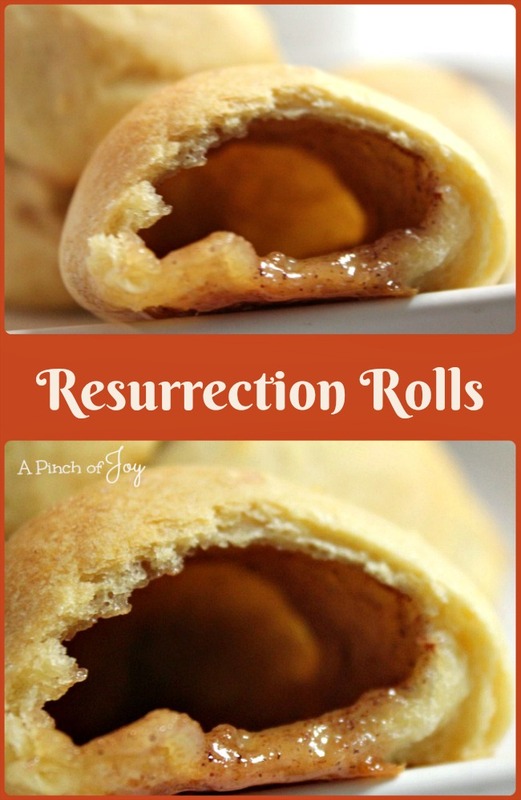 Sweetly delicious hollow rolls make a fabulous addition to breakfast or dinner table. They also are a creative and interactive way to explain the Easter Story to children. Mix cinnamon and sugar together ahead of time. Melt butter in microwave ahead of time. Separate crescent rolls and lay individual triangle on workspace. Dip marshmallow in butter and roll to thoroughly coat. Roll buttered marshmallow in cinnamon sugar mixture. Place marshmallow on narrow tip of crescent dough and roll toward the large end. Pinch dough together firmly at edges and any thin spots. Welcome to A Pinch of Joy. I’m so glad you stopped by today! Take some time to look around. Follow A Pinch of Joy using the icons on the teal bar at the top of the page so you don’t miss a thing! I’d love to have your company on this venture!! Share: if you found this helpful or inspiring please click one of the sharing buttons below! Your support of A Pinch of Joy is appreciated! Your rolls turned out so beautifully. My kids begged me to make these again this year! Found you on Chef in Training thanks for this recipe, we will be using it Easter Morning. 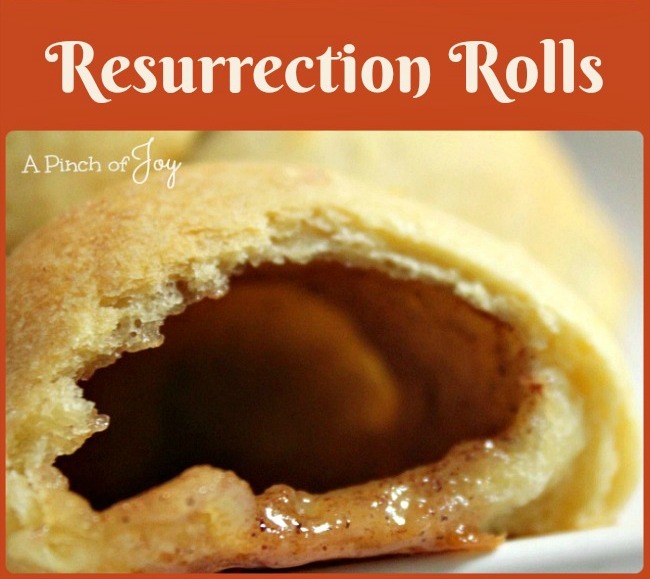 Wow, these are wonderful Resurrection Rolls and perfect for Easter Morning. Hope you have a wonderful Easter Celebration and thank you so much for sharing at Full Plate Thursday. What a great recipe I can’t wait to try this with my little one. Hi Charlene! I love these rolls. I’m glad you shared them! I am posting this on my FB page today. Thanks for joining the Rock ‘N Share! These are awesome!! I am so going to make these! Just found this blog and link party, so many great ideas!